1970 was a very important year for Scottish Athletics with the Commonwealth games at Meadowbank in Edinburgh. Don Macgregor and other contenders requested an early date for the Championship marathon, which was to be used for selection purposes, and the race was run on May 16th. This would give time for recovery before the Games event in July. The same course was used for both races – via Musselburgh and out the A1/198 to Cockenzie and then back to the stadium. Competitors included Wood, Macgregor, Alder, Stoddart and Fergus Murray plus Pat Maclagan (Victoria Park AAC), Jim and Alex Wight and Alastair Johnston (Victoria Park AAC) whose promising career came to a painful and premature end when his leg was shattered by a hammer during a race on the Meadowbank track in 1973. There was a record field of 62, and over 50 started, but some were not at their best. Alastair Wood had been invited to run for Britain in the Karl Marx Stadt marathon, which turned out to be a fiasco. Short of sleep and jaded after a delayed journey, he reckoned that his place (4th Scot) in the trial (2.19.17) was not bad considering. Later in the year he was second in Toronto (2.18.31) and won in Harlow (2.17.59). Bill Stoddart had been injured, but was still leading the pack until near twenty miles. Thereafter he wilted quite badly and considered himself lucky to finish 9th in 2.23.33. Five miles were reached in 25.51; ten in 52.18; 15 in 77.58; and twenty in about 1.44. As Donald Macgregor wrote “pretty even-paced stuff. Concentration kept the group tightly together until 21 miles when Jim Alder made a break and luckily I was the only one able to go with it. He allowed me to take up the running between 23 and 24 miles while he gathered himself for the run-in. Little did I know that Jim was having ‘un probleme digestif’ and that the running was not confined to the road. Photographs reveal that he had an ‘accident’ near the finish, but unfortunately my eyes were too feeble to notice or I might have run a bit harder over the last half mile. He sprinted in for a championship record of 2.17.11.” Donald himself was reported by Ron Marshall as “‘Very, very pleased,’ he breathed at the finish, head hanging characteristically to the left, ‘Now I’ve surely done enough to get into the team.’ His time was a personal best of 2.17.14.” Third was Fergus Murray in 2.18.25. In a high quality championship, England’s Barry Wood was fourth; Alastair Johnston 6th in 2.19.31; Pat Maclagan 7th in 2.20.49; Jim Wight 8th in 2.22.58; and Alex Matheson (EAC) 10th in 2.25.27. Ron Hill, in his book ‘To the Peak and Beyond’ mentions that the main contenders were reckoned to be himself, Bill Adcocks, Jerome Drayton of Canada and Derek Clayton of Australia. When someone protested to Clayton, ‘What about Jim Alder?’ he replied. ‘Alder’s got no class.’ According to Hill, Alder got to hear of this and, not surprisingly, became angry and went around muttering how he would ‘show them’! And show them he did. Although Ron Hill had a truly great day and after a supreme effort came home a clear winner in a lifetime best of 2.9.28 (European record), Jim Alder entered the stadium a very tired but brave silver medallist, holding off the challenge of England’s Don Faircloth by 15 seconds to set a new Scottish record of 2.12.04. Clayton and Drayton dropped out. Fergus Murray had a fine run (7th in 2.15.32) as did Donald Macgregor (8th in 2.16.53). Even now, more than 45 years later, the 1970 Commonwealth Games event remains by far the fastest marathon run in Scotland! A notable alternative to the results noted above was printed, at exactly the same time as the real event, in the ‘Victor’ comic, in which the illustrious Alf Tupper, inspiration of a generation of runners, represented Tristan da Cunha in the Edinburgh Commonwealth Games Marathon! Inevitably fortified by a big bag of chips at halfway, Alf passed two rivals on the track to claim the gold medal. Even Ron Hill would not begrudge Alf this peak achievement in a cherished athletic career. In 1971 Don Macgregor had a less happy experience in the Scottish championship on a similar course when, attempting his fourth marathon in less than three months, he dropped out with weary legs at 23 miles, having reached 20 miles in 1.48.15. This was to be Pat Maclagan’s year. The Victoria Park AAC member’s personal best time (2.20.49) had been achieved when he finished seventh in the 1970 trial. He worked at the time as a production planner at J&P Coats Ltd in Paisley. Pat, like Bill Stoddart a Scottish Cross-Country International, had been ‘pushing his luck’ by doing three marathons in 1970. A stress fracture the following winter gave him an enforced but valuable rest! By April 1971, however, he was fit enough to run 48.15 for second place to Andy McKean in the lightning fast Tom Scott ten miler. Training amounted to 100-120 miles per week at this time, and was still at 90 in the three weeks before the Scottish marathon. Most of this heavy work was ‘fartlek running in the forests around Aberfoyle’. Bill Stoddart remembered that ‘torrential rain greeted us as we prepared to warm up for the race and people could be seen dashing for cover. In a matter of minutes we were splashing around like ducks in a pond!’ In fact the weather was so bad that officials were forced to abandon (temporarily) the SAAA Championship Track events, while the road runners squelched onwards dourly. It was ever thus from a marathoner’s point of view – ‘track fairies’! After six days of training totalling 58 miles, Pat Maclagan remembered starting the race running through standing water in his Onitsuka Tiger shoes with added foam padding under the tongue, and heel pads. Since he did not wear socks, he had also taped the soles of his feet. Unfortunately the soaking dislodged a piece of tape, to his considerable discomfort. Pat recalled complaining about this to Don Macgregor, who replied callously or helpfully, ‘Why don’t you stop and take your shoe off, then?’ Instead, Pat spent some time trying to manoevre the offending tape between his toes so it became no longer a problem. Bill thought that no one was too keen to take the pace, due to the depressing conditions, so he led for most of 22 miles. By then Donald Ritchie had dropped back, as had Don Macgregor, and Willie Day (Falkirk Victoria Harriers) had come through. According to Pat, Bill and Willie tried to get away at this point but he hauled them back. Bill remembered Pat “speeding past me as if I was going backwards and he didn’t even say ‘Hello.’” Or indeed ‘Goodbye’! Pat Maclagan won by two minutes in 2.21.17, with Bill Stoddart second in 2.23.31 and Willie Day third in 2.26.07 – good times considering the weather. Willie was pleased to win bronze and take 12 minutes off his best time in this, his second marathon. Donald Ritchie was fourth in 2.28.39; and Charlie Macaulay of Aberdeen University 5th in 2.32.03. (Charlie was to emigrate to Australia and run 2.23 for fifth in that championship too). Pat remembered being confident of winning because ‘in general, the longer I ran the better I was, relative to most others.’ In fact he covered the last lap in 70 seconds! Earlier in the 1971, seven of the first eight finishers in the Edinburgh to North Berwick marathon recorded personal bests, led by Alex Wight (2.15.27), his brother Jim (also EAC) in 2.15.43 and Donald Macgregor (2.19.00). In the Maxol Marathon Jim Alder ran his usual fine race (6th in 2.15.43) but failed by 22 seconds to qualify for the British team for the European Championships. Alastair Wood was 8th in 2.16.06 and his long-time training partner and Aberdeen AAC team-mate Steve Taylor was 17th in a fine (2.19.28). Five weeks previously, in his marathon debut, Steve had won the Shettleston race in 2.23.25. 1972 saw the amazing Alastair Wood’s final victory (his sixth) in the Scottish Championship marathon – and a suitably crushing one it was too. A tailwind produced a brisk pace and by eleven miles the leading group was down to five: Alastair Wood, Bill Stoddart, Willie Day, Davie Wyper (a marathon specialist from West of Scotland ) and Colin Youngson (Victoria Park AAC). The latter, an Aberdonian, was running his third marathon. Youngson was teaching English at Kelvinside Academy and training hard with the likes of Pat Maclagan, Alastair Johnston and that illustrious star of the fifties, Ian Binnie. Encouraged by second place to Andy McKean in the SAAA Track 10 (50.15), Colin was about to discover that marathons inflicted fresh levels of discomfort! By the turn (and logically into a stiff headwind) Stoddart dropped back, followed in turn by Wyper and Day. Only the foolhardy Youngson sheltered behind the tough near-veteran Wood. This might have gone on for some time, but Wood glanced behind and barked imperiously something like, ‘Please do some work, you lazy good-for-nothing!’ Accustomed to being inferior to the great man, who had humiliated him so often (by tongue and leg-speed) during Sunday sessions back in Aberdeen, Colin obeyed instantly. After half a mile of battling the breeze he heard a brief derisive chuckle and could only watch vacantly as Alastair Wood, tactical mastermind, surged past and disappeared into the distance and out of sight. Finishing times were: first Alastair Wood in 2.21.02; second Davie Wyper in 2.26.14; and third Colin Youngson in 2.26.45. He explained the jig by jesting, “I hoped the 1500 metres would be on when I entered the stadium and I could have joined in that.” The article continued, “Wood has an old-fashioned approach to the sport. ‘Not for me excessive training, weight routines, heart measurements and getting all keyed up. That seems to land many of them in hospital. To me, running is something to be enjoyed and savoured, pitting my strength against nature. That’s the great satisfaction I get. Wood explained the ‘V’ sign. “As I passed the finishing line the first time some of the officials put one finger up to indicate that there was a full lap to go. I put two fingers up to ask if it was not two.” But for a man who knows every inch of tarmac between Meadowbank and Longniddry, there were some who thought that in his impish way Alastair Wood was in fact having a little joke against officialdom.” That October, Alastair went on to produce a marvellous performance in winning the famous London to Brighton 52 mile race – in 5.11.00, a record by ten minutes, and still one of the three fastest ever in an event that ended in 2005. After this race he was heard to comment that he felt that his legs had been sewn on backwards! Alastair Wood after his superb 1972 London to Brighton victory. Undoubtedly the performances of the year by a Scottish marathon runner were produced by Donald Macgregor of Edinburgh Southern Harriers – who shared the Scots Male Athlete of the Year award with sprinter David Jenkins. In the Maxol Marathon in June, he finished third in a personal best of 2.15.06 (to head the Scottish ranking lists) and thus qualified for the British Olympic Team. In Munich he surpassed even this performance. Timing his effort brilliantly he came through to 7th place, the highest achieved by a Scotsman in a final in the Munich Olympics. Furthermore he was less than four seconds behind the illustrious Ron Hill, who seemed severely shaken when Donald appeared at his shoulder! The winner of a memorable Olympic marathon was Munich-born Frank Shorter (USA) in 2.12.19; followed by Karel Lismont (Belgium) 2.14.31; Mamo Wolde (Ethiopia) 2.15.08; Ken Moore (USA) 2.15.39; Kenji Kimihara (Japan) 2.16.27; Ron Hill 2.16.30.6; Don Macgregor 2.16.34.4; and Jack Foster (New Zealand) 2.16.56. In 1973 events were inevitably less exciting, but the Scottish Marathon Championship served as a trial for the Christchurch Commonwealth Games team. Donald remembered the Scottish Marathon Championship race itself as tough but he did not have much difficulty in winning in 2.17.50 by 34 seconds from Jim Wight (Edinburgh AC) with Bob (or Rab) Heron (Aberdeen AAC) third in 2.21.15. Tony Moore, an Anglo from Hillingdon AC was fourth and Colin Youngson (VPAAC) fifth in 2.24.01. Martin Craven (ESH) was sixth, Willie Day (Falkirk VH) seventh and Bill Stoddart (Greenock WH) eighth. Alex Wight, Fergus Murray and Alastair Wood retired; Jim Alder was said to be suffering from anaemia and Lachie Stewart from food poisoning. The splits were 25.23, 51.50, 77.20, 1.44 and 2.11. In fact this was a typical ‘trial’ race for the Commonwealth Games, in that competitors tended to hang on until all hope of selection was gone, and then consider dropping out. It was a very hot day, with a fast pace aided by a following wind on the outward journey. The headwind on return added to the strain for those who could not keep up with the leading group. Several drastic slow-downs occurred, with reasons (or ‘excuses’) such as blisters, cramp, sunburn, sickness, severe stitch caused by a wet vest and the headwind, and simple exhaustion. Just a normal marathon, in fact. One newspaper report stated that the Meadowbank spectators ‘had to rely on five-mile reports about the leading group’. However ‘the entrance of Donald Macgregor into the stadium just before four o’clock brought back all the experiences, felt at second hand admittedly, that makes this race the finest of them all. Durable Dunky Wright wrote that at twenty miles, Donald was just in front of the Wight brothers and Bob Heron, but that after Portobello he “strode to a 500 metre win” (in 34 seconds ?) “and a sure place in Scotland’s Commonwealth team. ‘Plucky Jim Wight should come with me,’ was his charitable remark at the finish.” And indeed, both took part in the Games. Rab Heron, originally from Dundee, had been paired with Alastair Wood during Aberdeen AAC’s successful attempt in April to break the ten-man John O’Groats to Land’s End Relay record. Having run a rapid 2.17.07 in May, he had followed his usual preparation for the SAAA trial. After six months averaging eighty miles a week, he had suffered the pre-marathon ‘diet’. He wrote ‘To this day I am not sure that form of carbohydrate loading was all it was cracked up to be – the positive points perhaps being eclipsed by its sheer unpleasantness’. After Macgregor and Wight moved away, he was alone for the last six miles, his nylon Reebok marathons bruising a foot and producing a big blood blister on a little toe. Liberal smearings of nappy rash cream were effective in preventing painful friction in other sensitive areas – such as under his wide-mesh, heavy-duty cotton string vest from Millets! A glance at the SAAA instructions sheet for the 1973 race revealed the requirement for each competitor to send with his entry form a ‘medical certificate from a qualified doctor certifying his fitness to take part in a race of this kind’. Furthermore each runner ‘shall be required to take a physical examination before the race by Dr Robertson’. He could decide to withdraw ‘unfit’ competitors before or indeed during the race. Water would be provided at 7 miles and every three miles thereafter; with sponges available halfway between Water Points. Otherwise ‘no assistance whatsoever from any person’ would be permitted. A map of the marathon route includes precise measurements of ascent and descent all the way from Meadowbank through Portobello, Musselburgh, the Levenhall and Wallyford roundabouts, Tranent, round the turning point ‘beyond the Chance Inn Bridge’ by Aberlady, and all the way back, finishing with that gruelling drag up to the stadium and the final lap and a quarter of the track. Apart from the championship race itself, there were a few other noteworthy performances in 1973. Rab Heron led the rankings with a winning 2.17.07 in the North Berwick marathon on 12th May. Jim Alder ran 2.20.41 for third in the prestigious Enschede race in Holland. Martin Craven’s time in Harlow was 2.22.03. Colin Youngson won two races in Sweden – the Stockholm championship and the Swedish Winter Marathon; and Alastair Wood was victorious once again in the Inverness to Forres event. Sandy Keith was third in the Poly (2.22.53) and Charlie Macaulay 5th in the Australian championship (2.23.00). 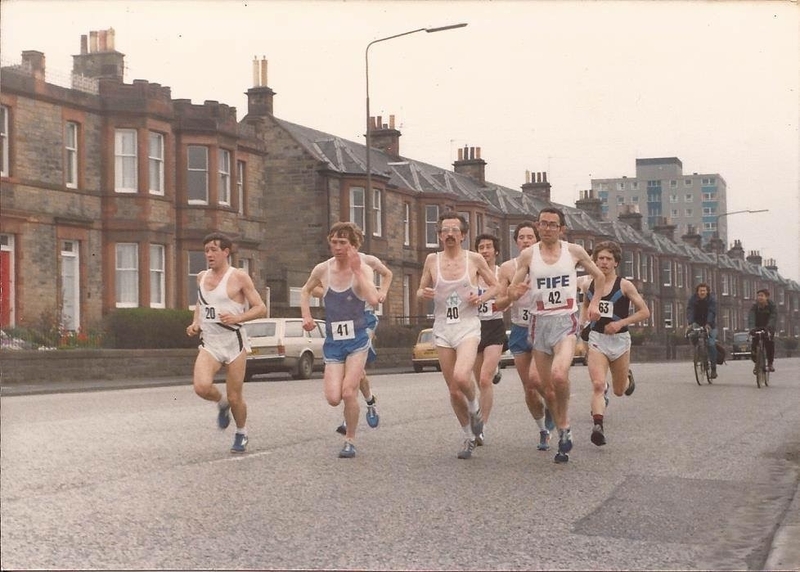 The Scottish Association of Track Statisticians writer comments “ When one considers that Wood, Steve Taylor, Ritchie, Keith, Youngson, Heron, Macaulay and Graham Milne are members of Aberdeen AAC, truly Aberdeen can be called the nursery of Scottish marathon running. Of the top twenty fastest times this year, thirteen were recorded by Aberdeen runners.” And all those named were well aware that this was due to the inspiring and exasperating effect of Alastair Wood and Steve Taylor, the leaders in one of the toughest Sunday runs in the world! No wonder that Aberdeen AAC twice broke the record for the John O’Groats to Land’s End Relay. 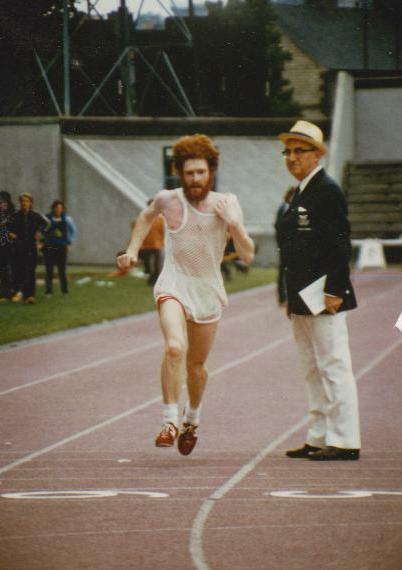 In Christchurch in early 1974, a fast-finishing Donald Macgregor produced another fine race – 6th in the Commonwealth Games. This was to be his best ever time – 2.14.15. Donald wrote that, after a respite period and a second build up, the SAAA Marathon on June 22nd 1974 was ‘probably the easiest – if you can use that word about a marathon – of my victories’. Donald’s best racing was off 4000+ miles per year, but he was below his average weekly mileage before this event. “I went off with Rab Heron – I had done the diet again – and we swapped the lead several times till 23.5 miles where he ‘gad a weakness’ and I kept going to finish in 2.18.08, he in 2.19.15. I remember coming into the stadium and feeling not too bad.” Heron’s Aberdeen AAC clubmates Colin Youngson (third in 2.21.36) and Sandy Keith (fourth) were next to complete the course. 1974: a silver medal for Rab Heron of Aberdeen AAC. Rab Heron’s second son was born in the early hours of the day before this race. Rab remembers that the headwind on the outward journey encouraged ‘a fair-sized group of ruthless runners to shelter behind a protesting Sandy Keith. His pleas for clemency were met with mocking laughter and a comment that it served him right for being so big. After the turn, Macgregor and Rab eased away. ‘We ran together, trying bursts every now and again, until 23 or so where the wily Don finally got away to win. Afterwards in the pub opposite Meadowbank, I saw Scotland being eliminated from the World Cup’. In his build-up to the championship, Rab had been averaging 90 miles per week, including fartlek and repetition running three or four times a week. Later in the seventies he turned to ultra-distances, finishing second four times in the Two Bridges 36 and being up with the best several times in the gruelling London to Brighton – including a second place behind Donald Ritchie in 1977. Nowadays he has retired to West Yorkshire and enjoys caving! 1974: bronze for Rab’s Aberdeen club-mate Colin Youngson. 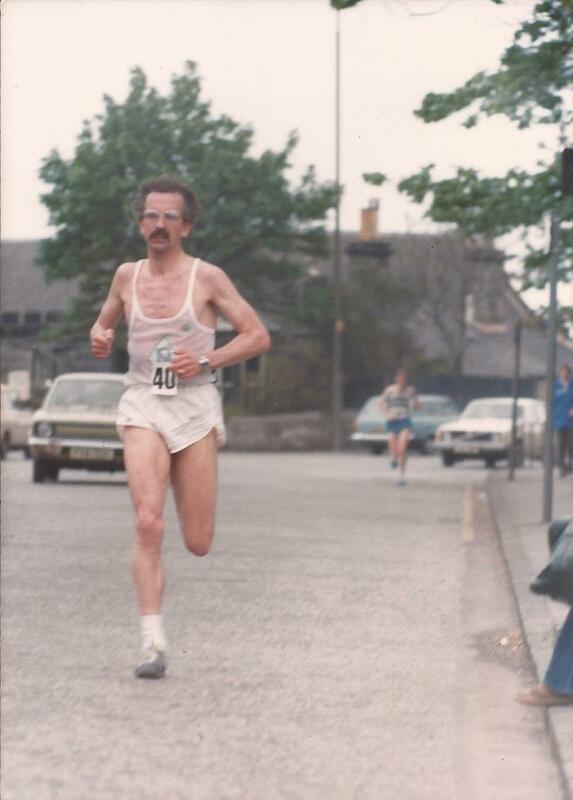 In 1974 Don Ritchie attempted his last Scottish Championship marathon until 1988! After going off with the leaders, he became very tired and at fifteen miles abandoned the race, deciding he was a victim of the carbo-loading diet gone wrong. His stamina was not in question – in October he finished third in the London to Brighton race (5.24.54) behind John Newsome (5.16.07) who just out-sprinted Cavin Woodward (5.16.13). A good race for Scottish marathoners was the Harlow event on 26th October 1974. Mel Edwards had won in 1967; and Alastair Wood in 1969 and 1970. But this was Jim Wight’s year. The Edinburgh AC runner romped away to an easy victory in a rapid 2.16.28, from Bob Lunnon (Gosforth) 2.17.36 and Don Macgregor (ESH) 2.17.46. Jim Dingwall (EAC) made a breakthrough to record 2.19.01 in fourth place; Colin Youngson (now working in Edinburgh and representing ESH) was eighth in 2.21.06; and Alex Wight (EAC) tenth in 2.21.53. Team winners were EAC, with ESH second (Sandy Cameron third counter in 2.38.18). An English team was allowed to win the Essex Championships however. Jim Wight (58) heads for victory and revenge on Don Macgregor. 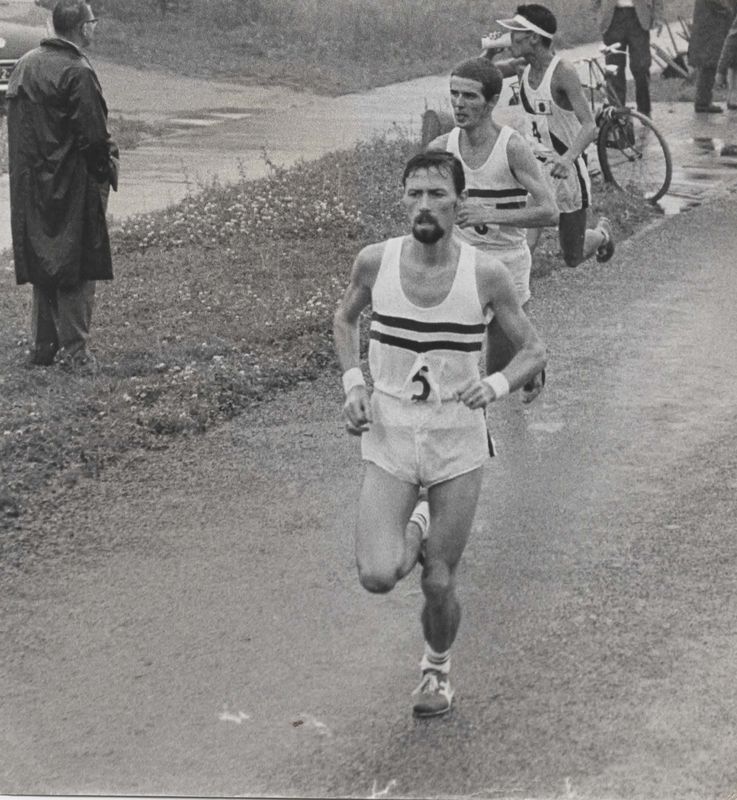 An especially fine performance in 1974 was Alastair Wood’s clear victory for Scotland in the World Veterans’ Marathon over a course near Paris. According to the winner, it was a very awkward route over cross-country paths, and he did well to record 2.28.40. When a vehicle carrying the film crew got too close to the irritable leader, he remembered waving vigorously and yelling, ‘Allez! Allez!’ to make them retreat to a reasonable distance! The winter and spring of 1974/1975 was important not only for traditional road and cross-country team events, but also as a time to log heavy mileage in preparation for a summer marathon. The Edinburgh training scene was very effective at this time. 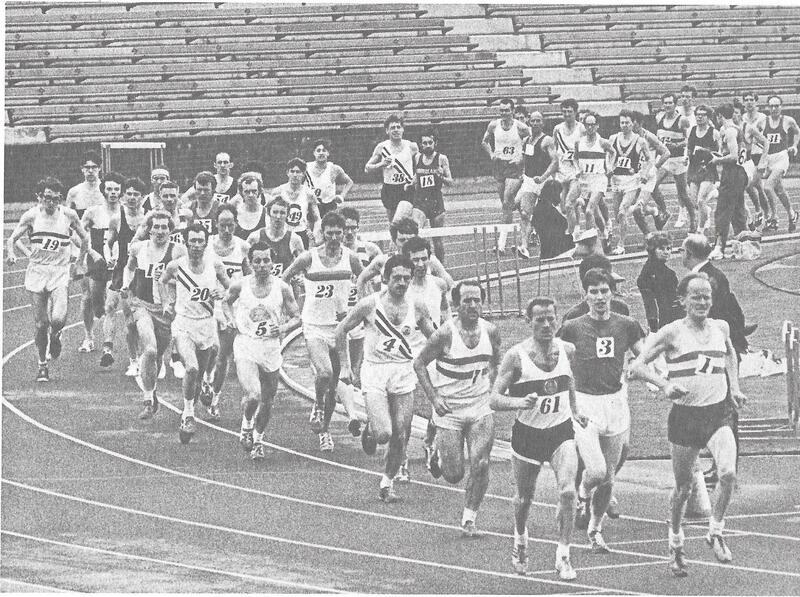 Ten years earlier in the mid-sixties, Edinburgh University runners had set the pattern, and athletes like Donald Macgregor and Jim Wight had built their success on training starting back then. Colin Youngson and Sandy Keith were two newcomers to the city, the former joining Edinburgh Southern Harriers and the latter Edinburgh Athletic Club. They quickly discovered three key sessions which were open to runners from any club. Monday meant the Meadows: four laps including no less than sixteen repetitions – short or long, on the flat, uphill or downhill on tarmac paths. Wednesday was a nine mile pavement fartlek through Colinton with a series of testing longer efforts. Saturday was race day in the 70s but no matter what state you were in, the Sunday run was compulsory – a basic sixteen miles from the Meadows through Colinton Dell and out the old railway line to Balerno. The route might be extended via the reservoirs and Bonaly tower. Anything between 16 and 25 miles might be covered (the latter with a sadistic little final lap of the Meadows, pretending not to be exhausted, until you parted from your companions/rivals with a cheery wave, turned the corner, and struggled wearily home.) If you added some recovery running or a few hill reps on the intervening days, you had about eighty miles of excellent training in the hilly city – worth a hundred in the flat south? 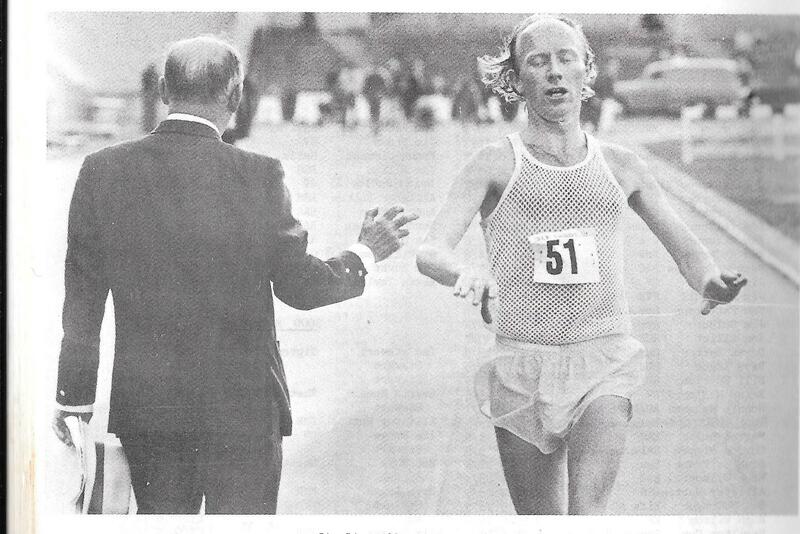 Colin Youngson had discovered an important fact two weeks after the 1974 Scottish Marathon Championship – Sandy Keith was stronger. Although Colin had been four minutes clear in the SAAA event, when both turned up for the Inverness to Forres race – ‘pot-hunting’ – the tables were quickly turned. After ten miles of a contest, Sandy’s superior stamina and powers of recovery became apparent, and he rolled away to win in 2.26 (only a minute slower than fourteen days earlier), whereas Colin managed only 2.33 (twelve minutes slower). Therefore throughout the following Autumn, Winter, Spring and early Summer, Colin was very careful to train with Sandy only when he felt fresh and competitive. Training every day with his friend and rival would lead to physical collapse for the Southern runner! Sandy, originally from Caithness, was an ‘iron man’ who had taken up marathon running while in the RAF. Martin Craven (who was to run 2.18.38 at Stoke in 1975) was an important training companion, and many others took part in the key sessions, such as Nigel Bailey, Fergus Murray and that rising superstar, Allister Hutton. The Scottish National Junior Cross-country champion, however, did not quite have the stamina yet to keep up all the way on the 25 milers with his more mature ‘friends’ Colin (27) and Sandy (29), who enjoyed their temporary slight superiority on Sundays – they certainly had no chance racing Allister over shorter distances! 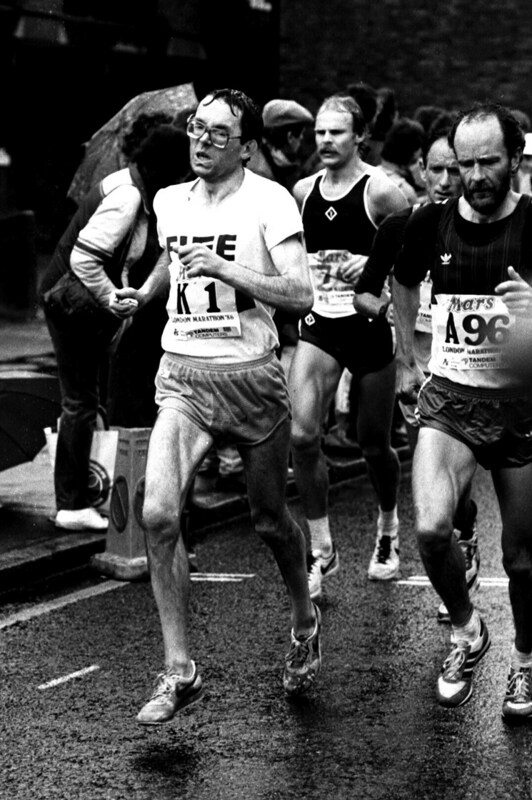 Hutton claimed he had no desire to try the marathon, and remained true to this for many years, concentrating on the track in the summer, and eventually breaking 28 minutes for 10000 metres, before winning a thrilling London Marathon in 1990 (five years after running the fastest marathon ever by a Scot – 2 hours 9 minutes 16 seconds). However, back to 1975. Youngson kept up his 80 miles per week while Keith ran over the ‘ton’. Early season races suggested that the Scottish Marathon was to be a real head-to-head. Colin ran 29.33 in the East District 10000 metres – second to Jim Dingwall; was second again (49 minutes) to Doug Gunstone in the SAAA track ten mile championship; and won the Dunky Wright trophy, presented by the man himself, for the Drymen to Scotstoun 15. Sandy was second in the Airdrie Highland Games 13 and won the tough Fort William 10. A fortnight before the event, Colin knew he was fit after his Sunday run. Wearing lightweight nylon Tiger racing shoes, he ran eleven miles by himself and then linked up with the group for the Balerno 16 on the old railway track. Over the last three miles he simply eased away to finish, still fresh after 27 miles, at the Bruntisfield Links. Some cautious training, the pre-marathon ‘diet’ and he lined up with Sandy Keith and thirty others on the Meadowbank track on 28th June 1975. It was a warm sunny day, and Sandy Keith took the initiative from the start, racing away down the hill to Portobello into a slight headwind. Only Colin tucked in behind and tried to relax. It seemed a hard way to start 26 miles! Sandy’s ambition was to win a marathon from start to finish, from the front – and how he tried! Five miles in 25.30; ten in 51.30; the turn in 67.30. As the pair, on their return journey, passed Alastair Wood and Donald Macgregor who were approaching the turning point, Wood muttered that the young fools would destroy each other. Macgregor warned that they were about two minutes ahead already! Since there was now a pleasant following breeze, and to show that he was feeling good in spite of Sandy’s efforts, Colin moved alongside and they ran together for the next five miles. Then, at nineteen, as the route swung into a lay-by to a drink station, an official was clumsy in handing up Sandy’s cup of water. Sandy swore, quite uncharacteristically, hesitated for the drink, and Colin, seeing that his rival was feeling the strain, simply surged away for a full mile, down the Wallyford hill: 20 miles in 1.43.45. A nervy glance back revealed a decent gap, fifteen seconds, and it was head down again and flat out for Musselburgh and Portobello. The pace was still fast, but tiredness and worry set in. To win the Scottish Marathon was Colin’s main ambition in the sport, and now it was a case of hanging on grimly. Up the long hill to Jock’s Lodge and then, at the twenty-five mile mark, Youngson’s right leg suffered cramp. Would Keith catch up, so near to the finish? Keeping the limb as straight as possible, Youngson bashed onwards, into the stadium and round the track. No sign of Sandy until the final bend was reached and it was safe to negotiate the straight and break the tape. What a relief for Colin Youngson, who felt sure that he must have broken the 2.20 barrier at last, but was very surprised to find that Jim Alder’s ‘big bowl of All-bran’ championship record had been broken by twenty-one seconds. Finishing times were: Colin Youngson 2.16.50; Sandy Keith 2.17.58; Alastair Wood 2.21.14; Davie Wyper (West of Scotland) 2.25.44; Gordon Eadie (Cambuslang) 2.25.48; Alastair Blamire (ESH) 2.26.20; Ian Trapp (EAC) 2.28.26; Mike Logue (Victoria Park) 2.29.56. The amazing 61 year old Gordon Porteous ran 2.51.35, a world over-60s record which he reduced by eighteen seconds later in the year by winning the world championship event in Toronto. His ‘Scottish’ time was three minutes fastest than in 1948! Gordon went on to break world records in the following age-groups: over-65 (2.57.00); over-70 (3.11.45); over-75 (3.23.12); over-80 (3.47.04). His first marathon was in 1945 and he showed no sign of his incredible potential when he managed only 3.00.14, since cherry pie for lunch produced severe stomach cramp at twenty miles, and he actually had to stand still for almost five minutes until the pain (and clubmate Andy Burnside) passed. After the race, Alastair Wood said, ‘Well done, Colin. I think you’re at your peak now.’ To which Colin replied that he felt there was a little more to come. But in fact Alastair did turn out to be right since this remained Colin’s fastest time ever. 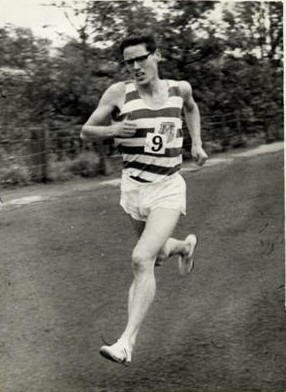 The rest of the season produced further success for Colin Youngson: second behind Allister Hutton in the 10,000 metres for Scotland against Iceland in Reykjavik; second behind Cavin Woodward in a fast ‘Two Bridges’ 36 miler; and a close second to Danny McDaid of Eire in the International marathon in Berchem, Antwerp. This was Colin’s only race representing Britain (until he became a veteran), and he and Max Coleby (3rd) won the team event. 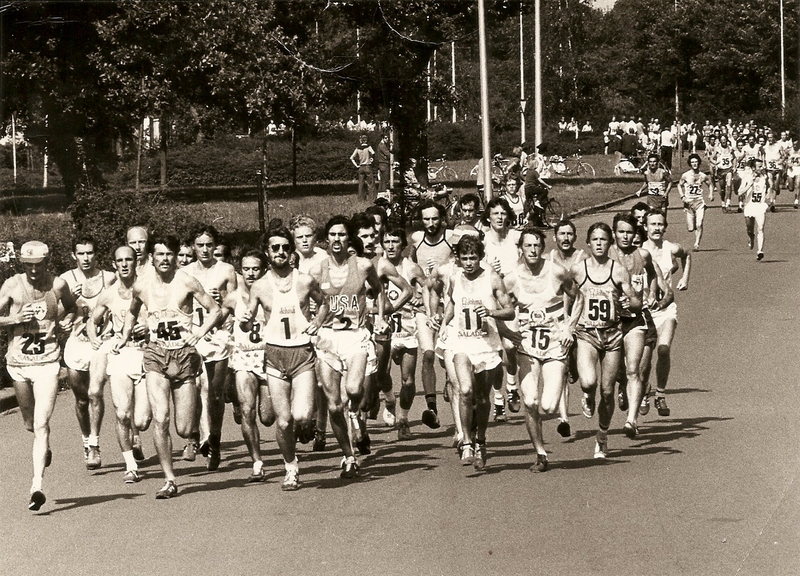 1975 Berchem International Marathon. Colin, Danny and Max on the rostrum. Sandy Keith improved even more. He was an excellent second to the great Ron Hill in the Enschede marathon; and crowned his season with a lifetime best, which headed the Scottish rankings, of 2.16.12, recorded when winning the Harlow marathon in October. Sandy Keith (56) on the way to victory in the Harlow marathon. In the next few years, Sandy became a regular British International marathon runner, although he never ran faster than in Harlow. Colin, on the other hand, tried a hundred miles a week, got sciatica, and was never quite as good again. Sandy’s toughness, resilience and stamina, as suspected, did turn out to be superior. 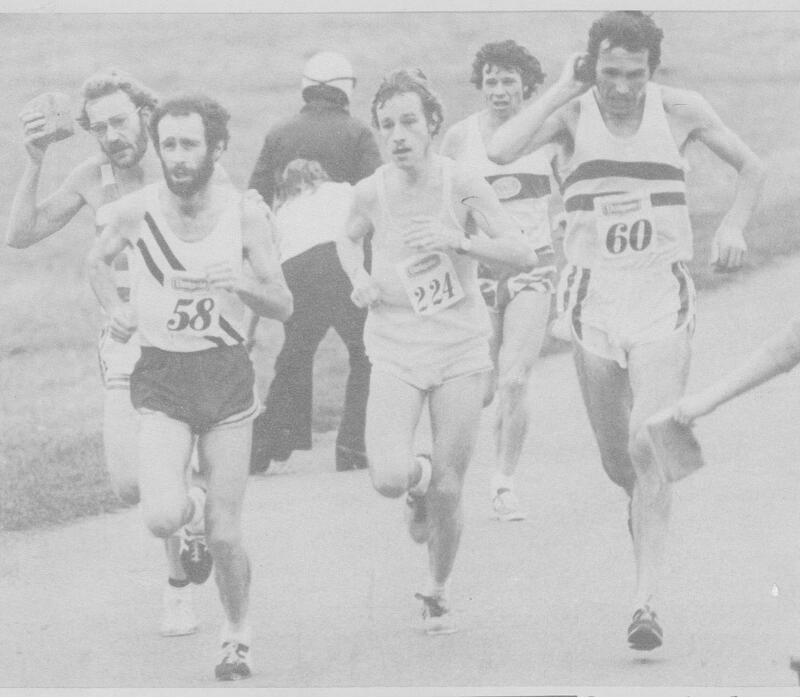 The other fast times by Scottish runners in 1975 came in the AAA event at Stoke. Martin Craven’s eleventh place in 2.18.38 has already been mentioned. Other times were Rab Heron 2.20.40, Don Macgregor 2.20.50 and Doug Gunstone 2.23.56. 1976 was the year of the Montreal Olympics. All over Britain, marathon runners trained harder than ever for the trial at Rotherham on May 8th. Some became super-fit and others over-trained. On a hot day over a hilly course, a pack of at least forty were still together at five miles. The pace was remorseless and the competition intense. Many cracked before the three medallists – and British Olympic representatives – reached the finish. Barry Watson (2.15.08), Jeff Norman and Keith Angus were ones who succeeded that day. Even Ron Hill and that other great Ian Thompson, European and Commonwealth champions, failed to make the team. Sandy Keith impressed in sixth place (2.19.02), with Don Macgregor 12th, Doug Gunstone (EAC) 14th, Alastair MacFarlane (Springburn H) 27th, Jim Dingwall (Falkirk Victoria H) 30th, Colin Youngson 40th and Willie Day 42nd (but still in 2.28.01). A particularly gruelling event. 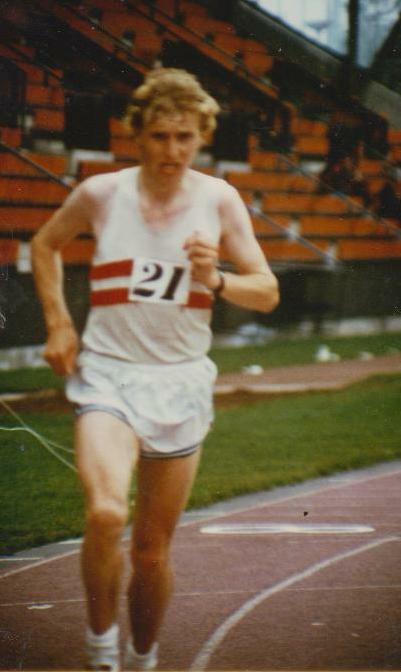 The 1976 SAAA Marathon, over the usual course from Meadowbank, and in conjunction with the Track and Field Championships, resulted in a win for the evergreen Donald Macgregor (Fife A.C.) in 2.24.12; from Doug Gunstone (EAC) 2.25.23; and Alastair MacFarlane (Springburn H) 2.30.14. Alastair, who later edited an excellent Scottish Marathon Club Magazine, wrote that he only ran the Scottish Marathon four times but won a medal on every occasion! He remembered that the summer of 1976 was one of the hottest on record, and that this race began at 1.40 p.m., the warmest time of the day. He shared the pace with Donald, reaching five miles in 25.48 – too fast for himself in the conditions. Consequently Alastair ‘came off the back’ and struggled for a few miles while Donald pushed ahead. Alastair recalled the tremendous heat as they passed Musselburgh racecourse and headed into East Lothian. He recalls scanning the road ahead and looking forward to a bit of shade from a row of trees – it was that bad. Doug Gunstone, a Scottish International on track and cross-country as well as road, and Alastair MacFarlane’s training partner, passed him at eight and a half miles and went away, but Alastair rallied and started to feel better all the way to twenty miles. After that, he describes the final section as ‘a survival job’. Doug had peaked for the AAA seven weeks earlier, recording a good time of 2.21.45 on a very hot day, but had maintained his seventy miles per week since then. Meanwhile, Donald won fairly easily since Doug, who had perhaps started too cautiously, did not get close enough to apply any real pressure, although he finished strongly. Alastair’s time was to remain his personal worst for the distance. Yet he was delighted to win a Scottish medal in the severe weather conditions. In fact he recovered very quickly, perhaps because he had used the Saltin diet of carbohydrate depletion pioneered by Ron Hill. The 21st of August 1976 was a sad day since Duncan McLeod Wright died at the age of 79. Many tributes were published. These mentioned his three appearances in the Olympic marathon, the first in the ‘Chariots of Fire’ Games in Paris 1924; his fourth place in Los Angeles in 1932, only 65 seconds behind the winner, Zabala; his Commonwealth gold in Hamilton, Ontario in 1930, and his bronze in London, 1934; his presidency of the SAAA in 1958; his writing and broadcasting; his encouragement of generations of young athletes. 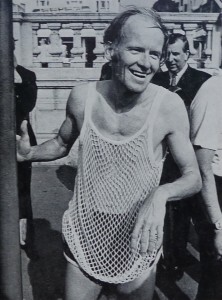 Yet Harry Andrew wrote for Dunky’s many friends, when he emphasised “to be a champion in the marathon, you have to have a heart of enormous size and quality, abiding optimism, infinite patience and a considerable sense of humour. All these qualities Dunky had in abundance. Plus an enormous unflagging zest for life right up to the end. 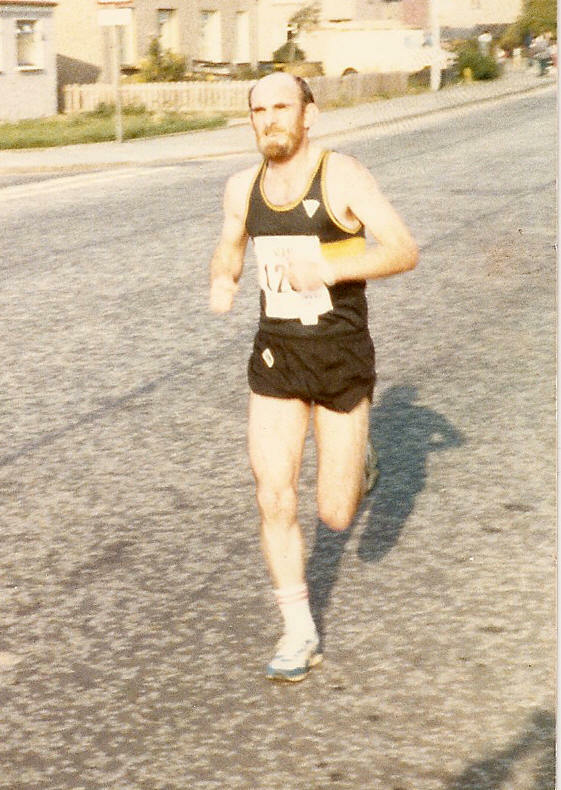 Jim ran over four thousand miles in 1977, including many weeks of over eighty miles and no less than 96 in the week of the Scottish Marathon Championship! Team spirit in Falkirk Victoria Harriers was excellent at the time, and he trained with other club members on Sundays, Tuesdays, Thursdays and Saturdays if there wasn’t a race. ‘Guys like John Pentecost, John McGarva, Joe Gibson, Willie Sharp and Willie Day made sure there were plenty of hard sessions.’ Recovery runs were from his home in Falkirk to his work in Grangemouth; and back. So he frequently ran three times a day. Rumour has it that, as in the case of Dave Bedford, Jim’s first session of the day was not intended to help with his fitness, but merely to offset the beer he occasionally sipped of an evening! Jim Dingwall, confidently but uncharacteristically, led from the start, passing 5 miles in 25 minutes exactly. By ten miles (51.12) he had opened a 2 second gap on Sandy Keith, who had 20 seconds on Colin Youngson, Willie Day, Martin Craven and Dave Clark, with Phil Dolan and Alastair Blamire another 30 seconds down. By half-way Willie Day had made a big effort and had caught Dingwall and Keith. The three leaders recorded 67.04, 50 seconds clear of Youngson and Clark. Jim had extended his lead all the way to the tape. He broke the Championship Record by 45 seconds with 2.16.05, which has never been beaten by a Scot. Jim reported that the previous record holder, ‘heartily congratulated’ him, too tired to throw a punch. Willie Day won silver in 2.17.56; Sandy Keith bronze in 2.18.52. Colin Youngson ran 2.19.35; Dave Clark (of Verlea A.C. and Aberdeen) 2.21.18; Phil Dolan (Clydesdale) 2.21.59; Ian Trapp 2.25.46; R. Stevenson (Maryhill) 2.27.31; Martin Craven 2.28.10; and Davie Wyper 2.30.09. Jim Dingwall concluded his account with ‘Beers at the Piershill. Happy days. I decided I would do the Scottish Marathon again once my record was broken. I’ve not been troubled!’ A week later, despite tired legs, he won gold in the SAAA 10000 metres! After a promising start as a Scottish Junior cross-country International, and years of hard training, this was Willie Day’s peak. By now an experienced marathon runner, he was Jim Dingwall’s main training partner, and had built up for this race very seriously, running up to 110 miles per week. 20 miles on Sunday was followed by days of 10, 15, 20, 15, 10 and 15. Sometime he and Jim ran a ten mile Thursday night fartlek in 53 minutes! Two weeks before the Scottish marathon he broke the record for the Bearsden 10, so he was confident of doing well in the championship. One time, Willie passed Jim running home from work. ‘He was on a fartlek. We stopped to say something, and when we had done so, I noticed Jim walking back the way he had come. He had obviously been just about to start a burst. That’s how he was – so meticulous at times’. What Willie refrained from mentioning was Jim’s prowess in sinking seventeen pints between 11 a.m. and 10 p.m. on the infamous ‘Water of Leith pub crawl’ between Balerno and Leith Docks – or indeed that Jim was world record holder for high peeing in Colinton Dell. What an athlete – and a gentleman! 1977 Enschede Marathon: Sandy Keith (45) ran well but other Scots faded in extreme heat. 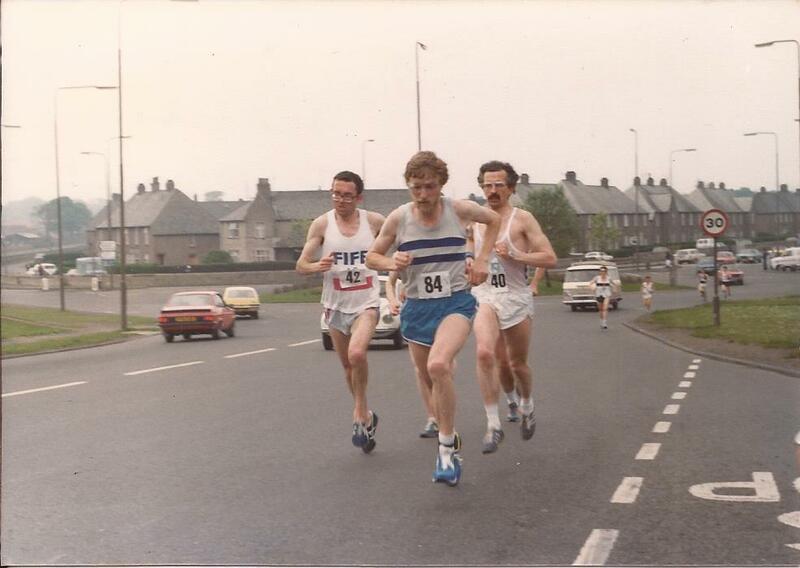 The 1978 Scottish Marathon Championship was one which lived on in the memories of participants in widely varying ways. The quality of experience depended on your point of view. It was, as usual, at the end of June, in conjunction with the SAAA Track and Field at Meadowbank. Colin Youngson had a foolish but traumatic tale. Having run 2.23 in the AAA Marathon – reasonable but not good enough, he sought a way to run faster without actually having to train harder. The carbo-loading diet worked quite well; and a large cup of strong real coffee (hot or cold) half an hour before gave a jet-propelled start, but what else? Dr Ron Maughan from Aberdeen, a prominent research physiologist, confidently stated that half a pint of cooking oil (or cream) would provide fatty acids to burn as fuel in the latter part of the race. There should be no need to slow down at all! The credulous (or insane) Youngson therefore drank (with difficulty) half a pint of cream half an hour before the race – and then, surprise, surprise, felt a little nauseous. He jogged a bit, went to the loo, felt unwell, jogged, went back to the loo, still felt unwell, and toed the line to start. Hopefully, his stomach would settle soon. This sick individual hung on to the leading group for six miles, and then had to let them go. The next twenty miles involved retching, pit stops, walking and struggling onwards, white-faced. Eventually he finished in eleventh place – 2.46.40, a lifetime worst. About five days later, he stopped feeling sick. When Colin mentioned to his ‘scientific friend’ that the plan hadn’t worked too well, Ron remarked coolly that a) the cream should have been ingested about three hours before the race and b) it was only a theory, after all. Moral of this cautionary tale? There are no real short-cuts to marathon success! Other legendary errors by Scottish marathoners include the athlete who swore by the carbo-loading diet – and did it every single week, as part of his training. And the runner who was very disappointed by his slowest ever race performance. It was pointed out, after discussion, that he had undergone the ‘diet’ the wrong way round – carbo-loading first and only protein before the race! No wonder he felt a trifle weak! The names are known, but their identities will not be printed. However, back in the world of serious marathoning, 1978. Ian Macintosh of Ranelagh Harriers had never considered himself an Anglo Scot because both his parents were Scots and he had been born in Glasgow, living in Govan until he moved to London in 1952. Ian had run Scottish Junior Cross Country races for Springburn Harriers. He also ran well in the Edinburgh to Glasgow Road Relay. In the Ranelagh 10, over a hilly course, Ian surprised Bob Richardson, an English Cross Country International, beating him by a minute in 49.30. In the bar afterwards, Chris Brasher (of Bannister mile, Olympic Steeplechase and London Marathon fame) suggested to Ian that, since it was Commonwealth Games year, he ought to try for the Scottish Marathon team. Jim Dingwall had already been selected. Ian knew Bob Dalgleish through his Springburn connection, so phoned him up. Bob got him into the SAAA race as a late entry, telling him that he had to win the race and run 2.18 or faster to be considered. As predicted, the hot weather made Commonwealth Games selection impossible. And in fact, although Ian was promised a representative vest for Scotland in another fixture, the phone-call never came. From his Finchley 20 performances of 1.40 – 1.44, he felt he had the potential to run a marathon in 2.15 – but it was never to be. In retrospect Ian felt that SAAA officials were parochial in their choice of athletes for Scottish teams. He cited the more recent case of that fine marathon runner Karen McLeod, born in Skye, who spent a fortune travelling from Bath to represent ESH, before at last her performances were recognised. Later on, Ian Macintosh helped with the City of Bath Half Marathon; and at the London Marathon Championship desk. In 1990 he was team manager (for England) at the Aberdeen Home Countries International (and SAAA) Marathon. The winner was Chris Tall of England. As he was presented with the Scottish Marathon Quaich, he shouted to Ian that the name of Macintosh was engraved for 1978. Ian didn’t even know there was a trophy – he’d only been given a medal. So the morning after the 1990 race, officials gravely presented Ian with the trophy – better late than never! Jim Dingwall, in excellent form, managed 2.13.58 for 5th place in the AAA over the Sandbach course. Sandy Keith ran 2.18.15, and was unlucky not to be selected. Only Jim Dingwall represented Scotland on 11th August 1978 in the Commonwealth Games Marathon in Edmonton, Canada. Sadly, he suffered during the flight to Canada and his training was seriously affected. Nevertheless, he led until halfway and then hung on bravely to the leading pack to 25km before he had to drop back. Paul Bannon, (formerly of Shettleston Harriers), a Scot who had adopted Canadian nationality, was in the lead at 40 kilometres, but eventually won a bronze medal in 2.16.51 seventy seconds behind the winner, Shahanga of Tanzania, and another Canadian, Jerome Drayton. Sub-2.20 Scots in 1978 were: Jim Dingwall 2.13.58; Dave Clark 2.17.55; Sandy Keith 2.18.15; Don Macgregor 2.19.19; Alasdair Kean (Derby) 2.19.42; and Doug Gunstone 2.19.51. 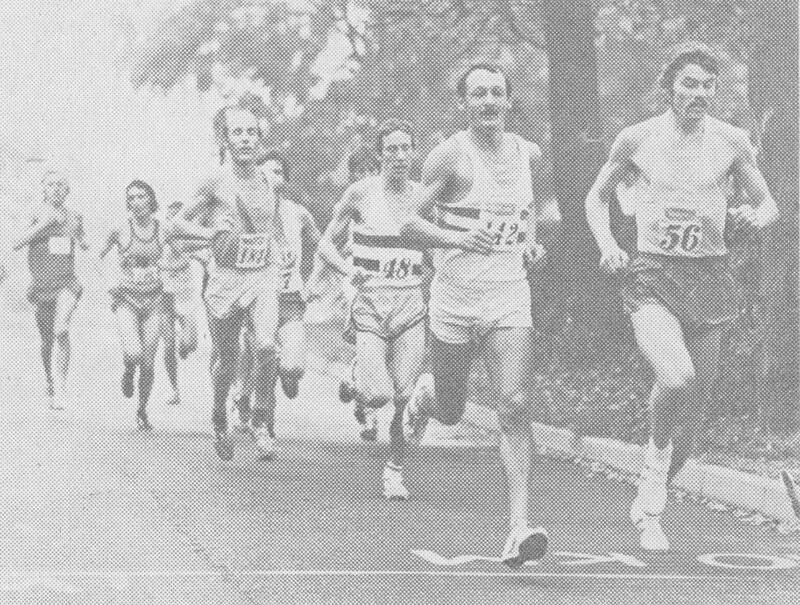 1979 was to see an increase in the number of Scottish marathon races, with the inaugural Aberdeen and Glasgow races in the autumn. However the Scottish Championship Marathon from Meadowbank on the 26th of May turned out to be a fine one. After a year of injury free training, a sensible blend of mileage and short or long repetitions, Alastair Macfarlane was in very good condition, having won the Clydebank to Helensburgh 16 by over a minute, and shortly afterwards set his fastest 5000 metres. 1979: Eric Fisher, Alan McGee, Macfarlane and Macgregor leading early on. Behind, left to right are Youngson (obscured), Ian Graves, Dave Lang and Jim Russell. By five miles (26.20), the leading group included: Alastair Macfarlane (Springburn), Don Macgregor, Colin Youngson, Ian Graves (Fife AC), Graham Milne (Aberdeen AAC), Dave Lang (Fife) and the 1977 Fellrunner of the Year, 21 year-old Englishman Alan McGee (Bolton United Harriers). Gerry Gaffney (Greenock Wellpark H), making his debut, was there too. The pace was steady, due to a slight headwind. Halfway (70.23) was reached by a pack of six: Macfarlane, Lang, Macgregor, Youngson, McGee and Gaffney. According to Colin Youngson’s diary ‘with the wind behind us, suddenly the pace of the return journey became suicidal – until legs dropped off’. Gaffney and Lang were left behind by 15 miles (80.30) and Alan McGee shortly afterwards. 1979: down to four – Macgregor, Youngson, Macfarlane, McGee behind. Donald Macgregor slipped off the group at 18 miles, and in the words of Alastair Macfarlane ‘at a watering point opposite Musselburgh Race Course – around 20 (1.46.07) and a half miles, Colin went for a drink while I kept on racing. So I was on my own, feeling good and running well, and knew that, although there were still over five miles to run, I would not be caught; a tremendous feeling to have in the later stages of a marathon when you are normally suffering a bit.’ Youngson simply remembered that, on the day, Alastair’s relentless leg speed was impossible to match – he was really in great form. Macgregor, having paced himself more sensibly, passed Youngson, but all three finished strongly to beat 2.20. The result was: first Alastair Macfarlane (Springburn H), relaxed and fresh in 2.18.03 (a PB by six minutes); second Donald Macgregor (Fife), two months from being a veteran, 2.19.15; third Colin Youngson (ESH) 2.19.48. Then came Alan McGee 2.21.26; Ian Graves 2.23.44; Gerry Gaffney 2.24.09; Graham Milne 2.26.25; Martin Craven 2.29.29; and Joe Small (Clyde Valley) 2.30.01. Gordon Porteous, now 65, produced another remarkable run – 3.03.24. Alastair on his way to victory, Colin can be seen behind. On September 16th, the first Aberdeen Marathon was held. 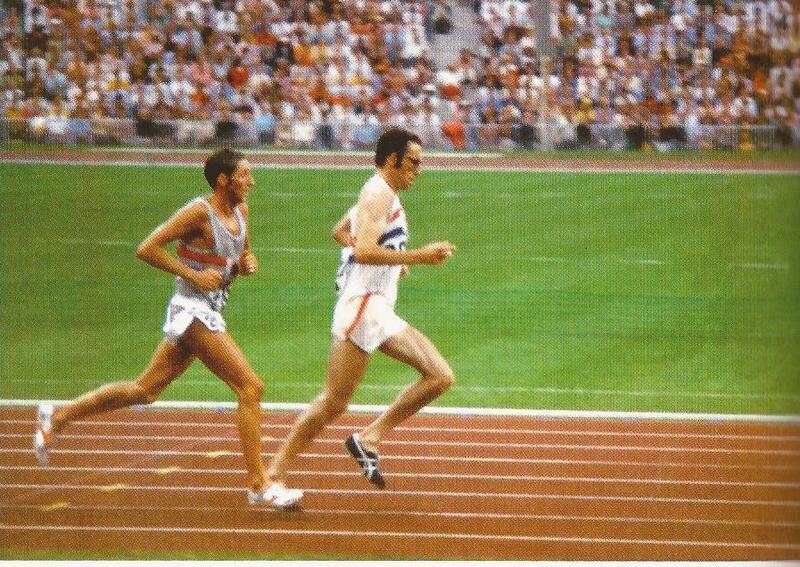 This turned into a battle between Jim Brown (Clyde Valley H) and Graham Laing (Aberdeen AAC). The former had beaten the latter by over a minute in the Tom Scott 10 miles; but over the longer distance, Laing, only 20 but very talented, and the 1979 SAAA champion over 10,000 metres, managed to defeat his illustrious adversary, an outstanding cross-country international and Scottish 10.000 metres record-holder. Graham won in 2.21.40 over a windswept, undulating course, with Jim 42 seconds down. Colin Youngson was a remote (2.27.44) but lucky third, after John Bigham (RAF Cosford) had lost thirty seconds by being sent off course to finish fourth in 2.28.00. Willie Day, who had run a very fast first fifteen miles, was fifth, Doug Gunstone sixth and Evan Cameron (ESH) seventh. On the 14th of October 1979, Olympian Barry Watson (Cambridge H) won the first Glasgow Marathon in the fine time of 2.17.45 after a real battle with Sandy Keith (EAC) (2.18.08). Significantly, Leslie Watson, who had won in both Aberdeen and Glasgow, was 8 minutes faster in Glasgow. Doug Gunstone, 5th in Glasgow, was almost 6 minutes faster than in Aberdeen. Don Macgregor, meanwhile, had broken the record (30.04.2) to win gold in the World Veterans Track 10000 metres. He had been second in the marathon – a feat he was to surpass in 1980.